The food is not the only attraction of the restaurant, but its theme and the overall experience that attracts you there. With its waiters dressed in funky cowboy gears, horses tied outside the entrance and an interior that is a cross between a ranch and a cow boy bar, Gun Smoke has caught the attention of Karaciites. Patrons are served by waiters who seem ready to dunk you at the slightest pretext, they slam down everything they serve, which is novel act of presentation. Complimentary peanuts adorn each table, with the waste casually thrown over the floor.. The menu selection is quiet extensive. From appetizers to sandwiches, even steak to pasta. Tangy, spicy and mouth watering chicken wings followed by a tasty selection of stuffed jalapenos that just melt in your mouth, are the perfect opening to the meal. 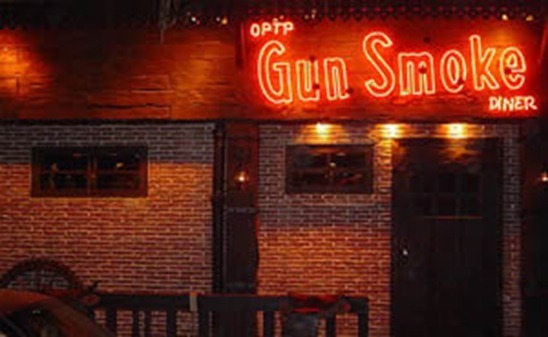 The restaurant offers limited privacy with loud music and close sitting arrangement.It also serves the ever popular shisha in different flavors.The prices are comparatively reasonable, an average of Rs 600 per head. Its situated at No. 10 Zamzama commercial lane, DHA 5, Karachi, and in Lahore it is situated on M.M.Alam road. Yes it’s a good restaurant with a unique theme, but I won’t put it as having reasonable pricing at Rs.600 per head. In fact if you are going to be having a steak and then some dessert, you will cross the 1000 mark easily. This restaurant moved to Dolmen mall recently. Honestly, I DO NOT recommend this restaurant. Food seems ok, but the waiters obviously need more education. They will keep you waiting outside, even though they have plenty of seats. In addition, be careful if you order salad bar. They will cheat you. In a menu, it says “single scoop” so if you get it twice, you will be charged twice. Also, they place “seasonal fruits” and “dessert” in a same salad bar, but those are priced separately. I ordered salad bar and got some salad, some lychee, and one small brulee of which I though are all included in the price, but I ended up with paying 2,000 something Rupees just for salad. GUN SMOKE IS A SCAM. NEVER GO THERE! Completely agree with what John as said in the beginning. I DO NOT recommend unless you are sure that your Blood Pressure will not shoot up because of POOR service and seemingly uneducated attendants!!! Wish you good luck if you still want to go and try your patience level by yourself! !